Arrive at Cologne Bonn Airport. If your cruise package includes a group arrival transfer, or if you have purchased a private arrival transfer, you will be greeted by a Uniworld representative and transferred to the ship. Step ashore in Koblenz, a historic town with a colorful past, eclectic architecture and an enchanting Christmas market. On today’s cruise along the Rhine, watch out for the Loreley rock, a tall slate cliff towering over the narrowest point of the river. Celebrated in song and shrouded in legend, the rock is famous for the tale of Loreley, a beautiful siren whose beguiling song doomed passing sailors. This morning you’ll reach the famous intersection of the Rhine and the Moselle. Where the two rivers meet, you’ll find the enchanting town of Koblenz. 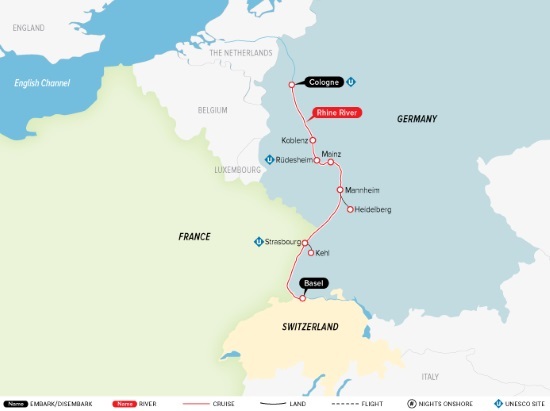 Later, spend a spectacular afternoon onboard your luxurious boutique ship as you sail the Upper Middle Rhine Valley. A UNESCO World Heritage Site, this stretch of the Rhine is extraordinarily picturesque: Castles perch atop steep cliffs above the water and each quaint village is marked by the spire of its historic church. Double your fun today with visits to two Christmas markets. The first is in Rüdesheim, a town famous for its life-sized Nativity scene, brandy-infused coffee and a quirky museum devoted to mechanical musical instruments. The next is in Mainz, the birthplace of Gutenberg’s revolutionary printing press and home to a 200-year-old Christmas market. Rüdesheim, like many cities along the Rhine, dates back to Roman times, when the Rhine was the northern border of the empire. Today, Rüdesheim is famous for its beauty and its entertaining alley of shops and wine bars called the Drosselgasse. It’s also home to a unique and fascinating little museum devoted to mechanical musical instruments. Then you’ll head back to the ship for a short cruise to Mainz. Mainz, standing at the confluence of the Rhine and the Main rivers, may be best known as the city where Johannes Gutenberg prepared his priceless 42-line bible for publication in 1485, using his newly invented printing press. You have the afternoon at leisure to explore the city that inspired such ingenuity, venturing off on your own to visit the Gutenberg Museum or one of the other intriguing museums nearby. Or you could stroll with the Cruise Manager through the Old Town neighborhood known as the Cherry Orchard, which is lined with picturesque half-timbered houses, on your way to the 200-year-old St. Nicholas Christmas Market. The millennium-old St. Martin’s Cathedral acts as its backdrop, and the holiday pyramid smack in the middle of the square reflects Mainz’s history— figures of Gutenberg and the ancient Roman commander Dresus join the standard angels and Santas. Mainz’s Old Town brims with specialty shops tucked into lovingly restored buildings: You’ll find jewelry, leather goods, books, toys—something special for every special person on your list. In your free time, a shuttle bus will also be provided to those who would like to visit the Wiesbaden Christmas markets. Disembark the ship. If your cruise package includes a group departure transfer, or if you have purchased a private departure transfer, you will be transferred to EuroAirport Basel-Mulhouse-Freiburg for your flight home.